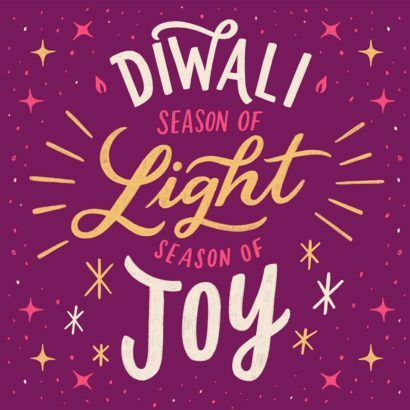 Diwali is the holy tradition celebrated by people of Hindu faith that symbolizes the victory of light over darkness and the beginning of the New Year. The celebration is one of the most important holidays for Hindus. Diwali is India’s most well-known holiday. It is also an official holiday in Singapore, Nepal, Malaysia and several other countries. There are an estimated 2.3 million Hindus of Indian origin in the United States, and there may be as many as 1 million practicing American Hindus who are not of Indian origin (Source: Hindu-American Foundation, 2008). Hallmark first created cards for Diwali in 2003. Diwali (Du-vah-ly) is a five-day celebration based on the lunar calendar that begins in late Ashwin (September/October) and ends in early Kartika (October/November). As with other Indian festivals, Diwali signifies different things to people around the world. In northern India, Diwali celebrates Rama’s homecoming from 14 years of exile after defeating Ravana and his coronation as king. In Gujarat, the festival honors Lakshmi, the goddess of wealth. In Bengal, it is related to the goddess Kali. But everywhere, it is celebrated with the same festive spirit and signifies the renewal of life. Often celebrations include lighting lamps, candles or fireworks.